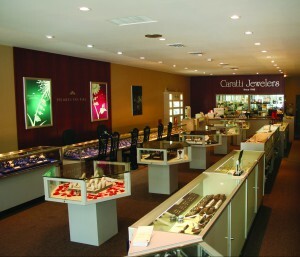 At Caratti Jewelers we offer world class designer brands with home town service. Located in the heart of downtown Livermore, Carratti Jewelers is your one stop shop in the Bay Area for custom jewelry, bridal sets, fashion jewelry, designer brands, watches, and more. Family owned since 1950, our owner and master jeweler, Colin, has over 30 years experience with custom jewelry design and repair. Our trained staff is dedicated to providing superior customer service, and your satisfaction is our highest priority. Whether you simply need a watch battery, or are looking for the perfect piece that reflects your unique style, at Caratti Jewelers you’ll be treated like family.